Mike Pizzi is on a Fulbright research grant to Jordan, where he is studying Internet access and social media use in refugee communities. 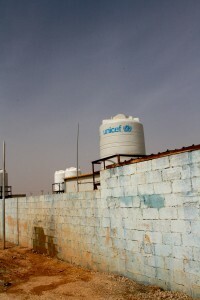 The following is the second installment in a two-part report on Internet use in the Zaatari Syrian refugee camp. He can be reached at Michael.W.Pizzi@gmail.com. In April, I returned to the falafel stands and cell phone kiosks of Zaatari’s makeshift market to ask Internet users what they were doing online. I already knew the lengths to which people were going in order to acquire Internet-ready devices and siphon electricity from the grid to charge them. 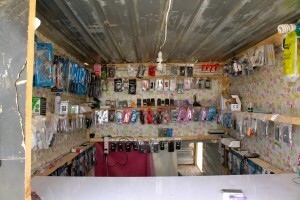 As a captive market while stuck in Zaatari, they were also paying inflated prices for mobile data or USB Internet “dongles.” Whatever refugees were doing on the Internet had to justify all this cost and effort, particularly given that other communication and information technology was readily available; cell phones are nearly universal in the camp and calls are cheap, and a large number of prefab housing units even had satellite dishes installed, indicating that people were watching TV. 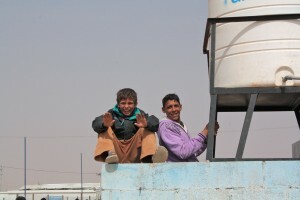 The Internet provides channels for communication and information not offered elsewhere, however, and I wanted to know which platforms Zaatari residents considered so essential. Previous studies on ICT (information and communications technology) use in this context have tended to assume that refugees will adopt new communication technologies when they facilitate more affordable or better quality communication with family around the world, and to some degree this holds true among Syrians in Jordan. Internet access in Zaatari, however limited, has facilitated cheaper and more constant communication with family and friends in both Jordan and Syria. But there are other motivations for prioritizing Internet access apart from communication with family in Syria, as evidenced by the fact that some of the refugees I spoke with didn’t have any family left there. Interviewing a couple dozen men in the market area, I asked each the same set of questions about their activity online, and was struck by how consistent their responses were. Almost every one of these men uses the Internet daily for two primary purposes: to keep in touch with friends and relatives, and to learn about developments in their hometowns via the tansiqiyat, or Local Coordination Committee Facebook pages, which provide regular news briefs and videos relevant to a specific city or neighborhood. That these two purposes were paramount in every discussion I had at Zaatari is not surprising. Given the costs and difficulty of access, it makes sense that residents would be accessing the Internet for highly pragmatic, and even urgent ends. For all that the Internet provides refugees in Zaatari, the men I spoke with did not claim that Internet access might altogether replace other ICTs, and it was certainly no substitute for in-person contact. When I asked how residents in the camp would gauge whether it was safe to return to Syria in the future, the consensus was that cell phone contact with relatives in Syria would be essential. Skype might have been implied in “phone contact” if Internet were generally fast enough to accommodate VOIP, but as it stands in Zaatari, cell phones are more reliable. Information posted on Facebook pages and news sites would factor into the decision-making process, people said, but no one would make a potentially life-altering decision, like returning to Syria, without consulting friends or relatives over the phone. With over 90% of these men logging on to Facebook daily, there were still those who were disinterested in spending time and money online. One of the only non-Internet users was a 44 year-old man named Nadir, from Dara’a. From behind the counter of his cell phone kiosk, Nadir said that he had never been motivated to use the Internet and seemed deterred by the learning curve. Specifically, he mentioned that he didn’t speak any other languages, which is an obstacle to access that I am exploring in my main survey. In reality, language barriers should not prevent Syrians, who generally do not speak much English, from using the Internet, but there is no doubt that Arabic can be difficult to work with online. It would seem that Zaatari is not somewhere people like Nadir are learning to use the Internet, if they never did in Syria. Yet even Nadir, who himself has never really used computers, was aware of the websites and applications that his children were active on, namely Facebook, Twitter, and Whatsapp, and mentioned that his nine children share a computer in Zaatari. A second limitation to more widespread Internet use in Zaatari is fear of surveillance and retribution, whether from neighbors in the camp or the regime itself. Everyone I approached was enthusiastic about explaining their reliance on the Internet for communication and news consumption purposes, and some people (the young men in these pictures, for instance), even demanded that I photograph them. But there were a few pieces of information that were off limits to me. I had hoped to collect a few Twitter handles so I could take a look at who was interacting with whom over social media, but quickly realized that I should stop asking for online contact info. Given the very public nature of my discussions at Zaatari, there were sensitive questions that I didn’t feel comfortable asking in person but was interested to pursue online. Almost everyone politely declined my request. I didn’t press as to why residents guarded their account names, but there is a pervasive fear of having one’s presence in Zaatari recorded, particularly if the regime remains in power. It is unclear how self-censorship and privacy concerns on social media manifest with Zaatari residents. Though they are effectively free of Syrian government surveillance, they live in a politically charged environment, where rumors swirl about regime spies sent to live in Zaatari and monitor refugees. Perhaps people fear that their Skype conversations with relatives back home are being tapped, or that their Facebook profile might give away their location. Whether valid or not, these concerns are probably ingrained in Internet users who are accustomed to using pseudonyms – many Syrians operate both a personal account under their real name and a political account under a fake name – and proxies in order to bypass regime censorship. Fortunately, not everyone in Zaatari is afraid to speak out online. 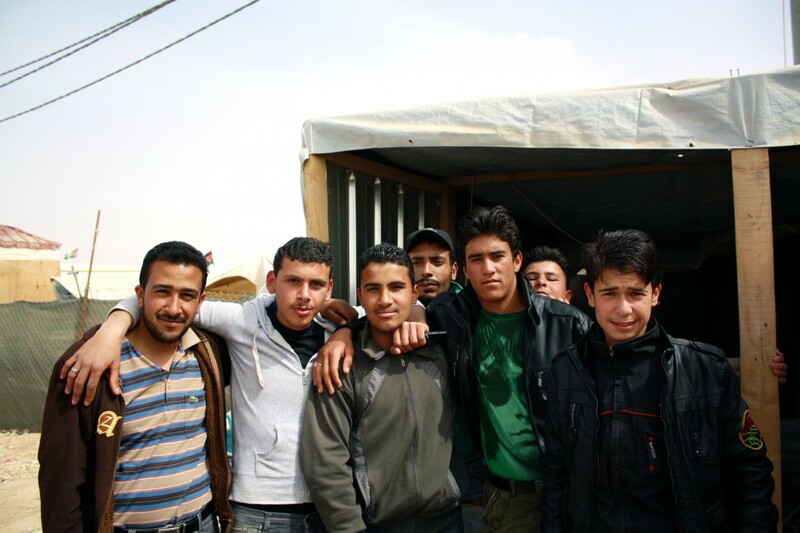 One initiative, Voice, is working to broadcast the Syrian experience in Zaatari to the world. ARDD-Legal Aid, in partnership with Oxfam, set up the Voice Middle East blog as a platform for Syrian refugees in Mafraq and Zaatari to attract attention to their situation without the need for a journalist intermediary. The project began in October and now sources narratives of life in Jordan on two fronts: five women in Mafraq operate as citizen journalists, recruiting submissions from among their contacts, and a men’s group in Zaatari does the same within the camp. 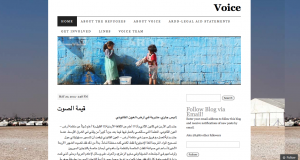 Voice publishes a newsletter as well, and I handed a few out on one of my trips to Zaatari. To the same end, Oxfam let Hasan, a Syrian refugee residing in Zaatari, take over its Twitter account one day in February and tweet about his day. By chance, his daughter, “Lynn,” was born that morning, which of course colored his commentary. The birth encapsulated for Oxfam’s followers a critical message: life goes on for refugees in Zaatari. Lives are not simply “on pause” while the crisis resolves itself, which points to the urgency of resolving the Syrian crisis. To that effect, ARDD and Oxfam’s efforts to provide Syrians with direct access to a global audience constitute a small-scale but significant effort to involve those most affected by the crisis in its resolution. Voice is an admirable initiative, but the contributor base for this type of project is limited by the relative difficulty of Internet access around the camp. For the same reason that I have not requested contacts within the camp keep in touch with me – I can’t ask them to use their limited resources on Internet access that simply serves my research goals – a project like Voice could only expand its scope if there were free, or at least more affordable, Internet terminals available within the camp. Citizen journalism could operate on a wider scale within Zaatari if Internet were more accessible. 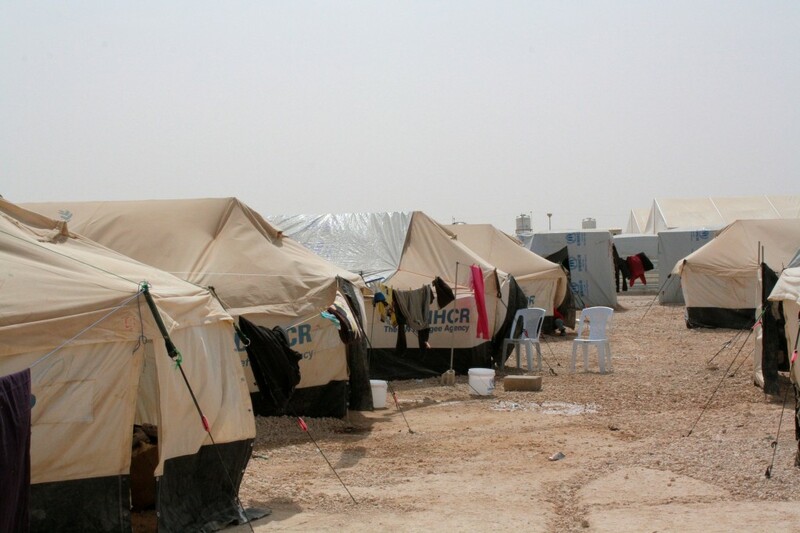 For the most part, relief groups working in Zaatari are desperately trying to scrape together funding for basic services like medical care and potable water. International Medical Corps and UNICEF have set up a computer lab for children at one of their Youth Friendly Spaces, but that is all I’ve heard about in the way of computer access for camp residents. As I mentioned in my last post, aspiring entrepreneurs are not willing to risk capital on an Internet café that might be shut down by the Jordanian mukhabarat immediately, so Zaatari’s “private sector,” its black market economy, is handcuffed as well. Considering the palpable enthusiasm for Internet access in Zaatari, it seems that it won’t be long before Internet access is a fixture even in emergency, ostensibly temporary refugee camps. The French NGO, Télécoms Sans Frontières (TSF), recently set up broadband satellite Internet for the Red Crescent offices operating in the Al-Salama camp in Turkey, and opened an Internet learning center for children there. TSF and other organizations have established connectivity in camp schools, hospitals, and NGO offices, but to date, no one has been able to designate resources to build public Internet cafes in Syrian camps. Those fleeing countries like Syria, where Internet access has taken root, won’t view the Internet as a luxury to live without, even temporarily. Once people have access to the world of information and social networks available online, they won’t stand being deprived of the Internet. This is more or less the conclusion I’ve come to from speaking with Syrian refugees in Jordan. In their case, not only has Internet access taken root in Syria, but it has also linked citizens to the revolutionary events occurring around the country, and aided them in circumventing authoritarian oppression. These associations don’t fade simply because Syrians have crossed the border into Jordan, and refugees certainly won’t resign themselves to isolation from the events transpiring just a couple hours away. With the aid of the Internet, Syrians can remain virtually attached to the land and people they have been forced to leave.